His abilities in battle and his virtuous qualities earned him the nickname “al-Fatih” or “the Conqueror”. When the Ottoman Empire sprang up in the early 1300s as a small Turkish beylik in Western Anatolia, it threatened the security of the Byzantines and their capital, Constantinople. By the time Sultan Mehmed II takes the throne in 1451, the Ottomans have expanded to control land in both Europe and Asia, thus surrounding the city of Constantinople. Sultan Mehmed made it his goal from the moment he took the throne to finally capture the legendary city. He ordered the building of a fortress on the Bosporus Strait, north of Constantinople to control ship movement in and out of the city. To honor the Prophet who declared the Muslims would conquer Constantinople, Mehmed had the fortress built in a way that it’s shape spelled out “Muhammad” in Arabic when seen from above. On April 1st, 1453, Mehmed and his Ottoman army of over 100,000 soldiers arrived at the walls of Constantinople. The sight that greeted them must have been terrifying. The inner walls of Constantinople were 5 meters thick at their base and 12 meters high. 20 meters away from the inner wall was the outer wall, which was 2 meters thick and 8.5 meters tall. These walls had never been conquered in history, and numerous previous sieges by the Ottomans as well as the Umayyads during the caliphate of Mu’awiya in the 600s attested to that. In addition to the walls, the Byzantines had a giant iron chain installed in the Golden Horn, a small inlet to the north of the city. This would prevent a navy from sailing to the weaker northern coast of the city and attacking from there. 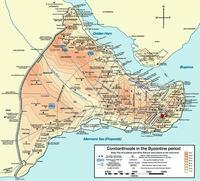 The Byzantines had a clear defensive advantage before the battle began. Despite being outnumbered and outgunned, the Byzantines were confident of their impending victory. Especially once additional soldiers and commanders were sent from the Italian city-state of Genoa. Mehmed offered the defenders the option to surrender and remain in possession of their property, lives, and families in peace, but this offer was refused by the Byzantine emperor, Constantine XI. Thus, Mehmed began the attack on the city on April 6th. Despite the best effort of the Ottoman soldiers, and the bombardment of the world’s biggest cannons, the city held out for weeks. On April 22nd, Mehmed ordered the Ottoman navy to be carried over land to bypass the chain in the Golden Horn. Over one night, 72 ships were carried over land and put into the Golden Horn, threatening the city from the north. It seemed that the battle of the city would soon be over as the Ottomans clearly had the upper hand. On May 28th, Mehmed halted all attacks and allowed his army to spend the day praying to Allah for victory. The next day, on May 29th, the army began a final assault on the city walls and before the morning was over, the walls were conquered and the city was taken. Perhaps the most important part of this historical event was Mehmed II’s treatment of the defeated Byzantines. He did not kill the residents of the city and in fact encouraged them to stay in Constantinople by absolving them of taxes. 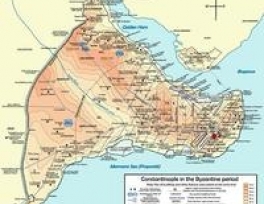 He insisted that the Greek Orthodox Patriarchate stay in the city and rule the Christians of the city on his behalf. While to the rest of Europe, the idea of religious tolerance was a foreign concept, Mehmed followed the Islamic principles on treatment of non-Muslims and gave religious freedom and rights to the Christians of Constantinople. His abilities in battle and his virtuous qualities earned him the nickname “al-Fatih” or “the Conqueror”.